Your order will ship TOMORROW if placed in the next 11 hours 1 minute . Enter your shipping address zip code to receive an instant delivery date estimate from UPS. Federal Fusion MSR 308 Winchester Ammo 150 Grain Soft Point ammo for sale online at cheap discount prices with free shipping available on bulk 308 Winchester ammunition only at our online store TargetSportsUSA.com. Target Sports USA carries the entire line of Federal Fusion MSR ammunition for sale online with free shipping on bulk ammo including this Federal Fusion MSR 308 Winchester Ammo 150 Grain Soft Point. Federal Fusion MSR 308 Winchester Ammo 150 Grain Soft Point review offers the following information; Federal Fusion MSR ammo was developed to be ideally used in one of the most adaptable group of firearms designed in years, the Modern Sporting Rifle. This is the ideal option for hunting ammo with MSR rifles for a number of reasons; performance, accuracy and dependability make this ammunition hunters dream. Each of this bullets have been tested to achieve at the optimum level of ballistics from 16” to 20 barrels, the standard lengths that these rifles are developed with. Designed with clean-burning, low-flash, fast-burning propellants, Federal Fusion MSR ammo is able to have enhanced velocity. Continuing with the components, the MSR ammo includes primers which are well-suited for firearms that incorporate free floating pins, while the military-style design of the case iris provides hunters with an additional visual confirmation of an accurate case metallurgy. Finally, Federal Fusion MSR ammo has been engineered to be precise to a hair splitting accuracy. MSR ammo has been formulated to include a molecularly fused jacket around a pressure formed core which allows hunters the optimum exactness that they have come to expect with Federal ammunition. Through this process hunters can avoid the worry of jacket/core separation happening throughout the hunt. With its boat tail rifle round design, this bullet include a faint dimple on the nose; this slight indentation provide some of the most extraordinary precision and lethal performance when it’s acquired and hit the target, sending a devastating shock through the body of the deer or medium sized game. This is all possible thanks to Federal’s engineering; with a combination of mass weight maintenance, a classified tip-skiving procedure advanced bullet integrity, hunters will have the performance that want and deserve for that ultimate trophy! As always Federal Fusion MSR ammo is a new production, non-corrosive, in boxer primed, reloadable brass cases. 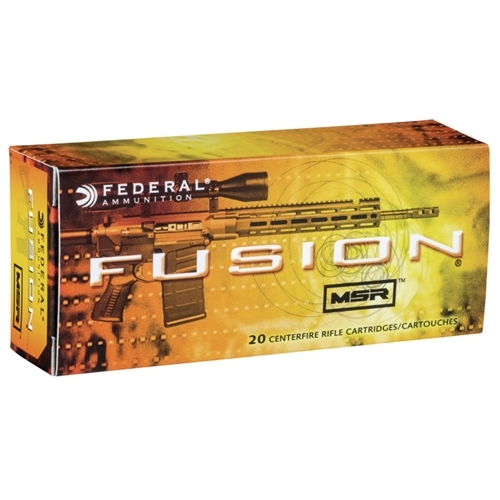 Federal Fusion MSR ammo is packaged in boxes of 20 and case of 200 with free shipping available on full case quantities. Federal Fusion MSR is the best thing going for the 16” barrel modern sporting rifles . With this MSR offering you will achieve the necessary velocities as well as accuracy , that of a standard 22”-24” bolt gun . Federal hit a home run with this MSR offering and I hope Target Sports USA keeps these in stock at this price for many years to come . 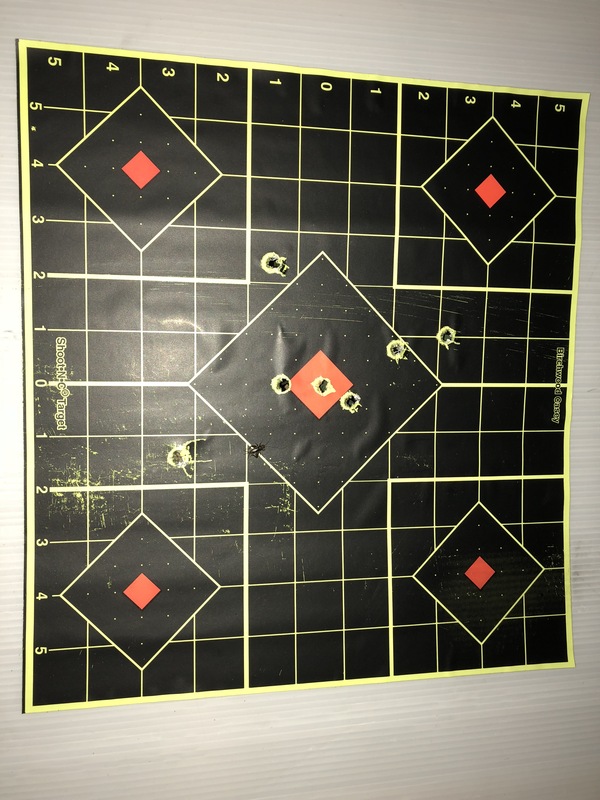 1" group at a 100 yards from my Sig716 AR-10. Not bad for a 2" MOA rated rifle! Went back and bought a case!